After you’ve been involved in a wreck, you need to make seeking medical treatment for your car accident injuries a top priority. Just moments after a crash, you’re likely to see bruises and begin feeling pain. For some, the after-effects of an accident are often not prominent until the next day when your body and mind have fully processed what happened. It’s important to seek medical assistance as soon as possible so that you can begin the chiropractic treatment process. Even if you were at-fault or partly at-fault, you may be entitled to $10,000 in medical benefits for your car accident injuries. 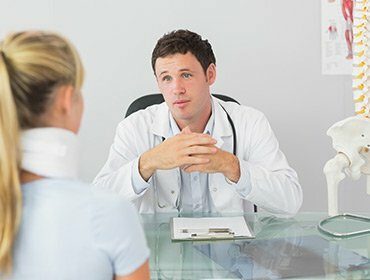 Your chiropractor can work with you to determine what benefits you’re entitled to for your car accident claim. Get the medical help you need from a trusted ChiroCare of Florida physician before you speak with an attorney or your insurance company to find out who to see for medical care. ChiroCare of Florida’s car accident chiropractors can identify the cause of your pain and develop a full injury rehabilitation plan. Depending on the injuries, your rehabilitation time may be prolonged. Accident victims who undergo surgery might have to complete injury rehabilitation to regain their strength. Those suffering from broken bones would also have to undergo chiropractic therapy once the bones have healed. When a vehicle comes to an abrupt halt, your neck may be jolted during a crash, which will likely lead to whiplash. Bruising of the internal organs may also occur from the abrupt stop or bumping of vehicles. The legs and knees might also be injured when they hit the dashboard or backside of the front seats. No matter how slow or fast an accident occurred, the impact of these injuries can be long-lasting. If you’re able to walk away from an accident, you might consider yourself lucky. However, there may be injuries lurking beneath the surface that can cause you pain and suffering. An experienced chiropractor can help identify soft tissue injuries and back injuries, including those that might have been missed even after an examination at a hospital. Injury rehabilitation can help reduce your pain, improve circulation and accelerate the healing process. Our goal is to help you recover from your injuries in the shortest time possible while also providing you with a plan for lifelong care should you require it. The auto accident injury chiropractors at ChiroCare of Florida are ready to provide you with the finest quality care during your time of need. After an initial consultation, a doctor can determine the best course of treatment for your injuries. An experienced team of ChiroCare of Florida doctors and professionals can answer your questions and guide you through the entire treatment process. As an accident victim, you may be entitled to medical benefits that will help cover your injury rehabilitation. Don’t let pain, discomfort and other medical complications impair your quality of life. Contact ChiroCare of Florida today to set up your first consultation. treatment for your car accident injuries with our physicians.